Meniere’s disease refers to a condition typically manifested by severe dizziness with vertigo, roaring or ringing tinnitus, fluctuating hearing loss, and a sense of ear pressure or fullness that is sometimes painful. Meniere’s can occur bilaterally in 25% of patients. It is more common in adults in their 40s and 50s. There are about 600,000 people in the United States that have a diagnosis of Meniere’s disease. About 50,000 cases new cases are diagnosed every year. 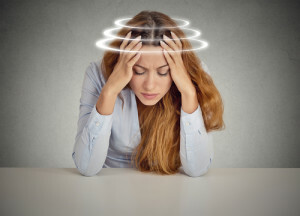 Dizziness may occur suddenly following an aura of roaring tinnitus and muffled hearing. Sometimes the dizziness is severe enough that patients are unable to ambulate. On the other hand, patients may complain of moderate to severe ear pressure and fullness with a sensation of ear fluid that is not evident on physical exam suggesting normal middle anatomy. This would therefore suggest inner ear pathology. and hearing signals to the brain. Abnormal endolymph build-up will interfere with this function. The disease can be familial. It can also occur secondary to allergies, viral infections, autoimmune disease, post trauma, and vascular disease. An audiogram will typically show low-frequency hearing loss that fluctuates, although this is not the case with all patients. Sometimes an MRI is done to rule out the remote possibility of a benign brain tumor. Reduced salt and caffeine intake. Typically a diet with less than 2000 mg of salt a day is recommended. Diuretics are also helpful by reducing the amount of fluid build-up within the inner ear which leads to less ear pressure and disabling symptoms. The acute bouts of Meniere’s disease with frank vertigo, nausea, and vomiting are treated symptomatically with Meclizine, Valium, Phenergan, etc. Patients who remain symptomatic despite medical treatment are sometimes good candidates for steroid perfusion of the inner ear. This reduces dizziness and ear pressure in a high percentage of patients, although tinnitus may persist. It has no risk on hearing impairment unlike Gentamycin ear perfusions which significantly raises the risk of hearing loss.